Training Industry continuously monitors the training marketplace looking for the best providers of services/technologies in support of corporate learning and development. This first annual list is designed to help buy-side organizations in their search for online learning platforms that possess on-demand libraries of courses and content for corporate/individual learning and development. Because of the diversity of products and services, no attempt is made to rank the Top 20. Udacity offers a range of courses for the tech industry, designed for both current and aspiring professionals. Through the Open Education Alliance, Udacity works closely with leading organizations to bridge the gap between what universities teach and what employers actually need. Coursera is an education technology company that connects millions of learners around the world with the skills and knowledge they need to transform their lives and careers. Founded in 2012, Coursera provides access to top-quality university-level education at a previously unimagined scale. Pryor’s blended learning approach includes live and online learning options. People can attend seminars, on-site training, or gain access to curated content in a cloud-based learning environment that doesn't obligate special IT requirements, pricey budgets or complicated timelines. Prositions is a provider of micro-video learning, technology and training content, including over 1,500 e-learning courses, DVDs and assessments as well as the expertise to help companies determine what their learning and development needs are. Prositions helps clients incorporate interactive, on-demand learning that employees can access whenever they need it. CrossKnowledge develops a comprehensive range of distance learning products: 20,000+ learning resources are available in 16 languages for training, assessing progress and helping learners put their newly acquired skills into practice. CrossKnowledge’s distance learning catalogue covers more than a hundred management, leadership and business themes. NIIT is a market-leading, global managed training services company with over 35 years of experience in learning outsourcing. NIIT's comprehensive suite of managed training services includes custom curriculum design and content development, learning administration, learning delivery, strategic sourcing, learning technology and advisory services. BizLibrary is a leading provider of online employee training and e-learning solutions. 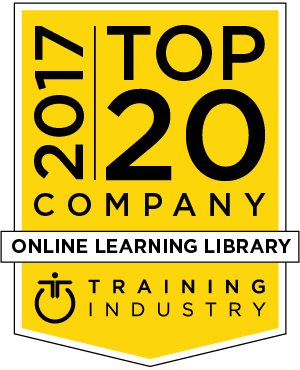 Their content library contains thousands of online employee training videos covering every business training topic, including communication skills, leadership and management, sales and customer service, compliance training, desktop computer skills, and more. EdCast’s award-winning knowledge cloud uses artificial intelligence, machine learning and analytics to weave internal content, expert insights and millions of external resources into an easy-to-use distributed personalized knowledge discovery platform. EdCast’s solutions, including its learning experience platform and suite of sales enablement tools are used by more than 50 global companies. eLearning Brothers is an e-learning solutions provider that offers award-winning custom e-learning development and e-learning templates. The company is on a mission to create “eLearning Rockstars” by providing the planet’s largest and most interactive library of assets for rapid e-learning content development. Harvard Business Publishing Corporate Learning leverages the management insight, thought leadership and expertise of Harvard faculty and HBR authors to provide solutions that are relevant to today's business challenges. For more than 20 years, they have developed and delivered innovative, technology-enabled solutions that drive business results. ej4’s short, mobile-friendly online training videos change employee behaviors, develop necessary skill sets and improve the company’s bottom line. With both off-the-shelf and custom short-form, engaging content, ej4’s goal is to help make its clients more productive than they were yesterday. Using their "excite, engage and embed" approach, Hemsley Fraser ensures that their digital, blended and face-to-face training programs truly engage learners and make a difference to the businesses. Hemsley Fraser's core library of on-demand digital assets and expert-led content, enables organizations to quickly pick and mix what they want. Udemy is a global marketplace for learning and teaching online. Udemy for Business offers 2,000+ high-quality courses taught by the world’s leading experts on a variety of key topics. In addition to this curated content collection, organizations can host and distribute their own proprietary content on Udemy. Degreed is a learning platform built for the way today's workers really build their expertise and grow their careers. Degreed integrates organizations' internal talent systems with the world's largest ecosystem of open learning resources - over 3 million courses, videos, articles, books, podcasts and more from nearly 1,400 sources. HealthStream is dedicated to improving patient outcomes through the development of health care organizations’ people. It helps organizations strengthen the revenue cycle, improve care transitions, increase retention, reduce risk, plan for leadership succession, be more compliant and understand their opportunities for improvement. Software and video tutorials designed by lynda.com help build skills providing you with an interactive solution that fits your training interests, schedule and learning pace. Online courses designed by LinkedIn Learning instructors help users at all levels of experience master the skills that help them succeed in their professional and personal projects. Velociteach is a project management training company. Services include courses in a traditional instructor-led, virtual or e-learning format; on-site group training or open enrollment classes; licensing training materials to organizations; and custom project management curriculum development for organizations. Skillsoft is a trusted partner and leading global provider of high-quality, innovative, cloud-based learning and performance support resources. Skillsoft's 165,000+ courses, videos and books are accessed more than 130 million times every month, in 160 countries and 29 languages. Backed by CallidusCloud, Litmos is an enterprise learning solution that unifies learning management, the extended enterprise and prepackaged content in an innovative platform to meet any organization’s internal and external training needs. Litmos is highly secure, focuses on the end user and provides time to value three times faster than traditional learning solutions. Simplilearn provides training for digital marketing, cloud computing, project management, data science, IT and software development. With 400 training courses designed and updated by world-class industry experts, Simplilearn’s blended learning approach combines self-paced online courses and instructor-led live virtual classroom training, applied learning projects and 24/7 teaching assistance.